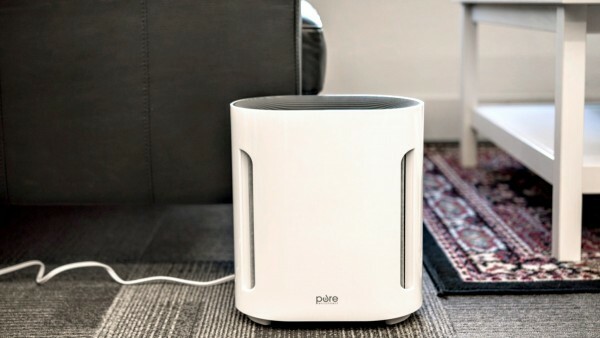 Purezone - 3-in-1 True HEPA: Air Purifier Review • The Air Geeks, reviews of air conditioners, dehumidifiers and air purifiers. PureZone 3-in-1 air purifier is one of those appliances that do their job just as expected and as is advertised. For those looking for some relief on their sinuses and pet dander, we urge you to read on to see what gems come with this purifier and see whether they are up to your standard. This guide will attempt to describe most of the outstanding features so that the next time you hit the store, you will have better knowledge of what you are looking for. With so many cheap purifiers promising much but disappoint in delivery, let’s see what this one has in store for us. Right out of the box, you will notice the elegant design that is attractive beautiful to the eye. This purifier is sleek and modern to have in your living room or office. Everything is well placed in its position with the control panel at the top and front access to the filters for easy replacement. A 3-in-1 filter is fitted in each one of this meaning the air sucked in gets to pass through 3 stages of sanitization before being released back to the atmosphere. First, the air is passed through a Pre-filter, then on to a second True HEPA filter before finishing its journey through activated carbon pellets. This ensures that the air coming out is free of pet dander, foul odor, dust and smoke particles as small as 0.3 microns are gotten rid of. After it leaves the filtration chamber, a bright light of UV-C is shone to it in order to eliminate any germs or bacteria present to ensure the air coming out of the appliance is sanitized. This ensures 99.9% of air coming out is done a thorough job of purification to ensure it is safe for humans to breath. This creates a comfortable environment for those people with allergy, asthma, and other respiratory issues. It also acts as a relieve especially if you live in fire-prone areas as the constant smoke, even when not visible can cause nuisance or problems to your health. PureZone 3-in-1 air purifier knows how to keep the noise to the minimum and do a pretty good job with that. For as low as 30dB this is way below most people’s tolerance rate although the higher fan settings are a little bit louder, they are still in the range of what many people would consider low. The level on this device can never get lower. Moreover, you are never going to get a quiet appliance that uses a motor, especially if that motor is used to rotate a fan. Next up is the control panel. It is conveniently placed at the bottom so you won’t have to stretch down so much to access the buttons. The buttons are touch sensitive and respond very quickly. The fan settings can be adjusted to 3 different levels with the lowest being the quietest and slowest. There is also a filter indicator that notifies you when it’s time to change the filter. The filter can last up to 6 months of moderate usage. The speed to which the filter gets damaged depends on your frequency of use and also the condition of the air in the room. An automatic timer is also included if you want to keep the appliance on for a certain amount of time, ranging from 2 to 8 hours of operation. This purifier covers an area of about 200 sq. ft, which is not the widest in its class but is overall thoroughly purified. This makes it ideal for kitchens and other places susceptible to mold odors such as the basements. If your living room is larger, you could be better off with a bigger one. The night mode is very quiet: If you love quiet rooms when sleeping the night mode is very efficient. So I'm giving this five stars even though we have had to replace the filters after 6 weeks, not six months. The thing is that the AQI around here has been as bad as 438 due to forest fires, and these little machines have given us sanctuary in a couple of rooms where we don't have to wear masks all the time. Attaching pictures of new filters next to old. Buy this one does the job. And then some. When the air cleared I turned it off for a while because it was starting to smell smoky because the filter was full... and immediately started having horrible issues with asthma." I've been sleeping with this in my bedroom for a few weeks and I seem to have fewer allergy problems when I sleep, even now that ragweed season is in full swing. The lowest setting is very quiet and almost inaudible so the sound isn't any problem. The only complaint I have is that the LEDs are way too bright and uncovered, it's like having a night light in the room. I found a way to cover them enough but it would have been good if they came covered with some kind of solid lid." 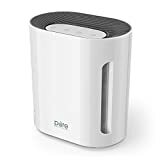 PureZone 3-in-1 air purifier is the right option for those who have smaller rooms and are ok with having to move purifiers so often to clean air in different rooms. If you love having a purifier in the kitchen or washrooms during the day and placing it in your bedroom during the night this would be the right model. The minimum noise level is so good it is rare on the current market. If you are sensitive with the UV lighting, which produces traces of ozone gas, you might opt out of it or purchase another brand.